Reasons why you need a dog right now. Once you have a dog there's no turning back ( just the same as with blonde hair) you can't imagine your life without them. And that is not a bad thing at all. 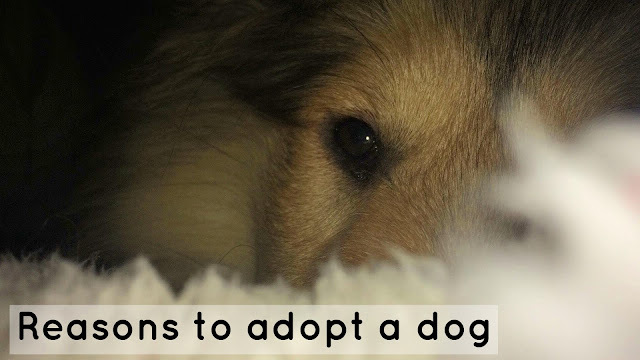 But I know that a lot of people always get in the doubt - should I adopt a dog or not? I say yes, you absolutely need a dog in your life. And here some humor full (and some also very serious) reasons why. There is always someone happy to see you - Let's be honest. Have you ever seen a dog sad when they see their people? NO. Even if it 5 minutes or 5 hours you are away they will always show real happiness that you are back and isn't it just great? Sometime ago somehow it happened that I had a 14-hour long shift at old work and it happened that my doggy was home alone. I managed to get home in the middle of the day and then in evening.....honestly I couldn't get the doggy away from me how happy he was that I'm home. There's always a good reason for 5 hour long walks - No one asks questions why you have spent almost all day outside just walking randomly because they see your little buddy that needs his everyday exercise. For a lot of people, this may be the reason why they decided not to adopt a dog because they won't have time. But it's not true, in the morning it helps you get up even better than your morning coffee. Sure you don't have to wake 5 hours earlier to walk, it will be good for 20 minutes and when you have time the bigger one. Also, walking with your dog somehow helps you not to think. You get really relaxed. Dog's are the best listeners and don't ask stupid questions- This is the same as with little babies, till you don't have one you look at those people who are talking to them like they are totally weird, because of ''they too little to understand what you are saying''. Same goes not only with dogs but also cats and all other animals.And you know? Sometimes I feel like my dog can really understand me and sometimes it all that needed, just a lil buddy looking at you with cute lil eyes and not asking any stupid questions which sometimes means more than anything else because sometimes you just don't want to answer. Dogs are always there for you - And we can't say this about a lot of creatures. Even some animals sometimes go somewhere where you cant get them. But not dogs. Even if he will be busy with something, you will just need to call him and he's next to you making you warm and cuddling next to you. Dog's gives you unconditional love - Dogs don't matter, where you live, what you look like, how much money you have if they love you they will love you until the end.And it doesn't matter what kind of dog you have, because they all have this amazing thing with them. This is the end of my list I hope I made you sure that you want a cute little doggy in your life. Is there any point I missed? Write it in comments. I need no convincing when it comes to needed a dog, I can't wait to eventually get one. I cannot tell you how much I agree and LOVE this post - a dog is the best thing you can have, they love you unconditionally and are there for you no matter what. They don't care how much money you have, what you look like - they love you for you! I love this post. A dog is definitely our best friend.